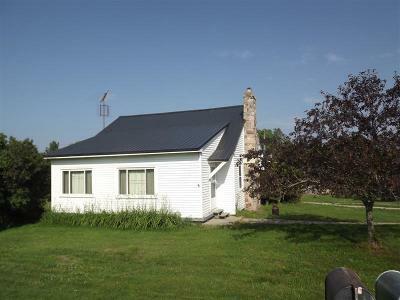 TWO BEDROOM AND ONE BATH SINGLE STORY HOME LOCATED ON A WONDERFUL 33.79 ACRES OF OPEN AND WOODED PROPERTY. NEWER WINDOWS. METAL ROOF AND FURNACE. COZY AND COMFORTABLE OPEN LIVING SPACE. TWO CAR DETACHED GARAGE AND OTHER OLDER OUTBUILDINGS PROVIDE PLENTY OF STORAGE SPACE. SEVERAL ACRES OF PASTURE LAND OFFER AGRICULTURAL OPTIONS. LOCATED WITHIN MINUTES OF MENOMINEE. COME AND SEE IT TODAY!